& from Wales / Cymru including Hadleigh Heath. This is the rarest of the rare when it comes to UK FZ releases. Issued in March 1967 by EMI, the next issue in the early 70s was as a double, stereo only, issued by Polydor. This album was issued in both Mono & Stereo, with the Mono copies being most common. 03. Who Are the Brain Police? Unique to this pressing [& the Mono equivalent] is the inclusion of the 2:35 SINGLE version of 'Trouble Every Day'. Normally these are found in 'much loved' condition - Shagged. The covers are seldom complete & the vinyl looks as if Fido himself has been dining thereupon for the last forty years. Sometimes the covers are even in two halves, desperately clinging together, held only by the failing adhesive of ancient yellowed clear sticky tape. The vinyl is an impressive EX/EX+ with just a couple of light cosmetic hairlines [probably paper scuffs] visible on very close inspection to prevent a mint grading. There are only a few marks around the spindle hole. The sleeve - a unique single pocket flipback variant for the UK issue - is in a strong VG+ state. There is no writing or major defect of any kind, there is minimal shelfwear or edge scuffing & the spine is clearly readable. There are three micro tears starting at the centre of the opening edge where the laminate finishes about 2mm early. There are a few creases to the laminate, but again nothing notable. The back is still white with very little sign of being forty years old. The Garrod & Lofthouse sleeve is nicely dated '6703' on the bottom flipback. All three flipbacks are secure. Personally, I have been a Zappa fan since I was thirteen years old [which, believe me, was a long time ago now!] and I have never seen a copy as good as this before. They don't turn up often in any case as very few sold at the time, most of those were Mono, and the vast majority were carried from party to party and ended up being handled by a lot of 'worse for wear', shall we say, individuals. 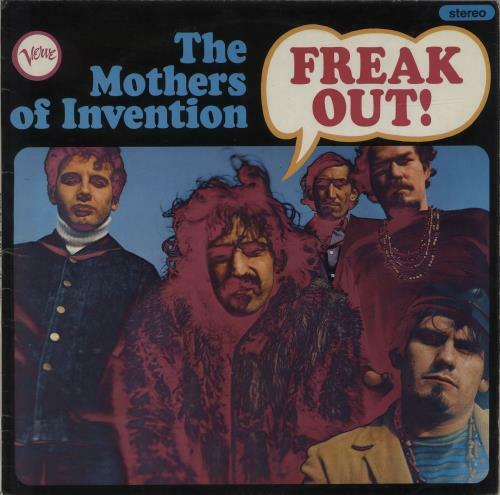 Product Information Frank Zappa Freak Out! - Original Verve Issue - Flipback P/s UK vinyl LP album (LP record).